As you know, most houses sport roofs coated with tiles. Occasionally we’ll encounter some thatch roofing, but they’re pretty widespread. 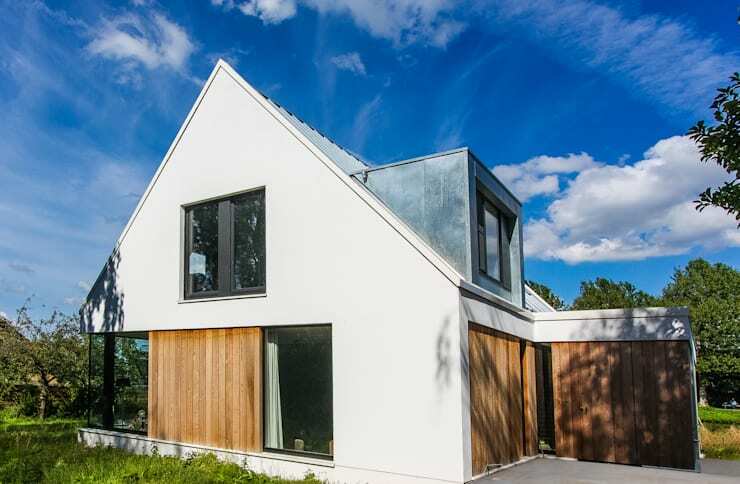 But how often do we see zinc roofs? Dutch team Scanabouw Bv decided not often enough, which is why their design boasts a shiny metal surface serving as the roof structure on today’s homify 360° discovery. Not only is this a unique and eye-catching element, but it is also a sustainable solution. Zinc roofs are extremely corrosion-resistant and self-healing, meaning that the material can recover from scratches over time. In addition, it also has a low maintenance care regime. 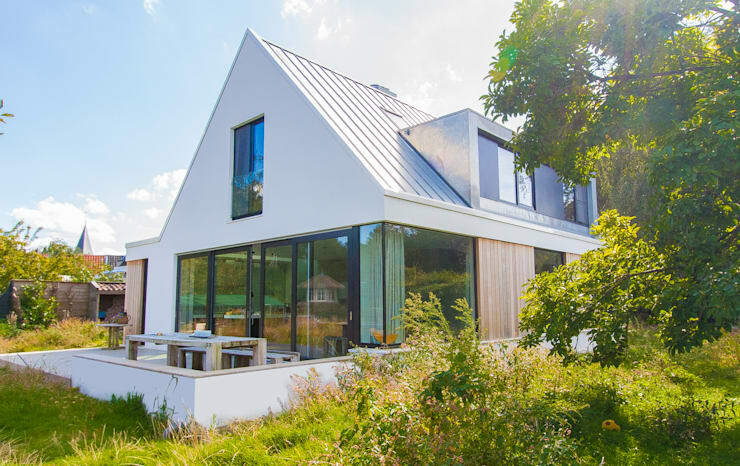 What architects love about zinc roofs is its capabilities to form into interesting shapes and curves while still retaining its durable qualities. Even though the architects can’t take credit for it, the blue sky certainly boosts the aesthetic quality of this structure. And although this is the Netherlands and grey skies are guaranteed, this house will still manage to look gorgeous. Its beautiful white plastered walls, wooden features, glass surfaces and, of course, tin roof make will make sure of that, as they make for an exceptional combination. Truly a beautiful facade that certainly arouses the interest, and we haven’t even set a foot inside! Time to admire this stunner from the other side – and what a view comes into play! 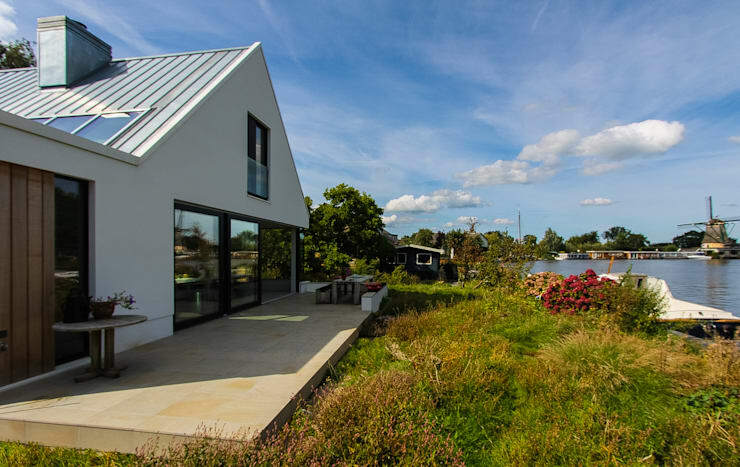 The house is situated on the Dutch Vecht—a branch of the Rhine River in the Dutch province of Utrecht. This area has seen numerous majestic estates of wealthy Amsterdam merchants over the past few centuries. This house chose this scenic location, and we couldn’t be happier (or more envious). What could be better than relaxing on your own outstretched terrace? How about a view of the river and windmill to boost your visual pleasure and awaken the poet/artist in you? 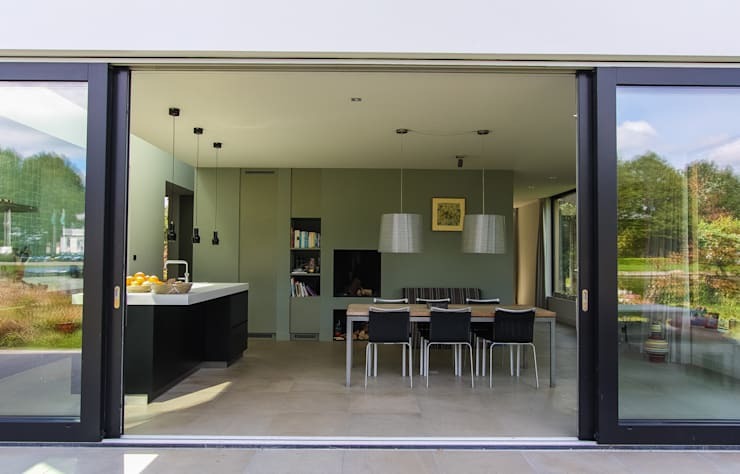 The generous glass sliding doors separate the terrace from the dining room/kitchen area. What other cooks can boast about having this view as a backdrop while preparing meals? Notice that the terrace tiles and interior flooring are identical, making this the perfect link between in- and outside. From here we can see that the interior walls have been coated in a light sage green, which fits harmoniously with the cream-coloured flooring. Beautiful lighting fixtures dazzle the dining space, although we’re sure their lighting isn’t enough to overpower the beauty of the landscape. What recipes require “natural lighting”? All of them, if you’re lucky enough to have this kitchen as your workspace! 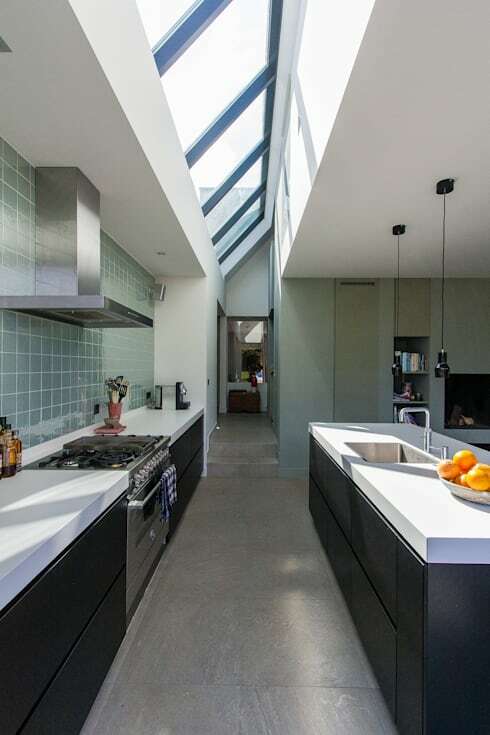 A lengthened patch of glass glazing allows for a decent amount of sunshine to filter into the house – just like an elongated skylight. And when dusk falls, all we do is uncork a bottle of wine and admire the beauty of the stars from this very kitchen. The green wall tones from the dining space continue into the kitchen, albeit in a tiled format. We just love how the dark cabinets offset against the white countertops, and how the stainless steel appliances stand out from the green backdrop. Visual beauty at its finest! We are up the stairs and peeking into the bathroom, where a unique little window ensures some daylight glow. This space opted for plain white versus dark, and it couldn't be more appropriate. A nice helping of porcelain, tile, wood and mirror make up the bathroom, and exquisite wall lights are just waiting to light up the room as soon as the sun sets. 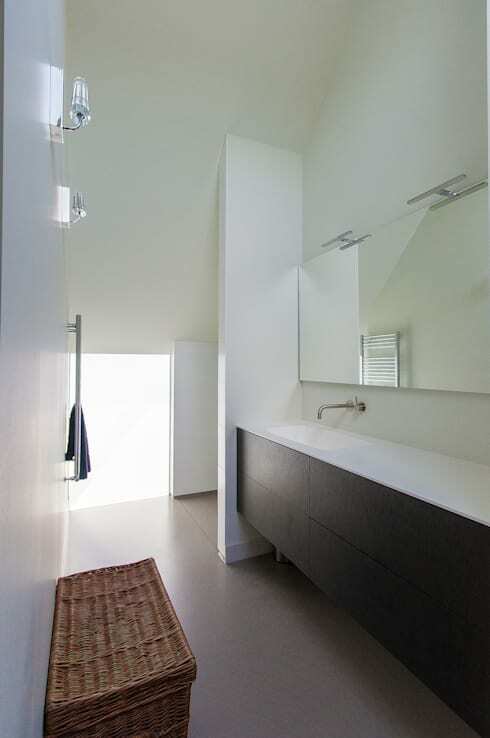 Speaking of bathrooms, be sure to take a look at these: Shower Designs Worth Singing About. We end our tour with another view of the façade, but from a different angle. Notice how the growing vegetation seems to want to envelope the house, gently holding it in a lush, natural hug. And with the sun in full glow, the timing couldn't be more perfect for a patio picnic! homify has an extensive range of balconies, porches and terraces that is sure to please your unique requirements (or curiosity). Enjoy the viewing!